Community involvement is valued among our ZAS team, sharing our talents and resources to help shape the generation of today that will shape the work of tomorrow. For the past 2 years, Zimmerman Architectural Studios, Inc. has been involved with the Wisconsin Art Education Association in The Visioneer Design Challenge, a unique, one-of-a kind, statewide learning program and competition for middle school and high school students interested in design arts and connecting with professional designers. Challenges have been developed by professional designers who currently work and have careers in current design fields. These challenges cover design in everyday things, design of spaces and places, design for communication and information and design for human interaction. This program may connect directly your school district’s goal of preparing students for post-secondary readiness. Some examples of design areas since the program’s launch have included: Architecture, Animation, Digital Photography, Exhibit Design, Fashion Marketing, Game Design, Graphic Design, Illustration, Interior Design, Point-of-Purchase Design, Product Design, Urban Planning, Video Production and Web Design. 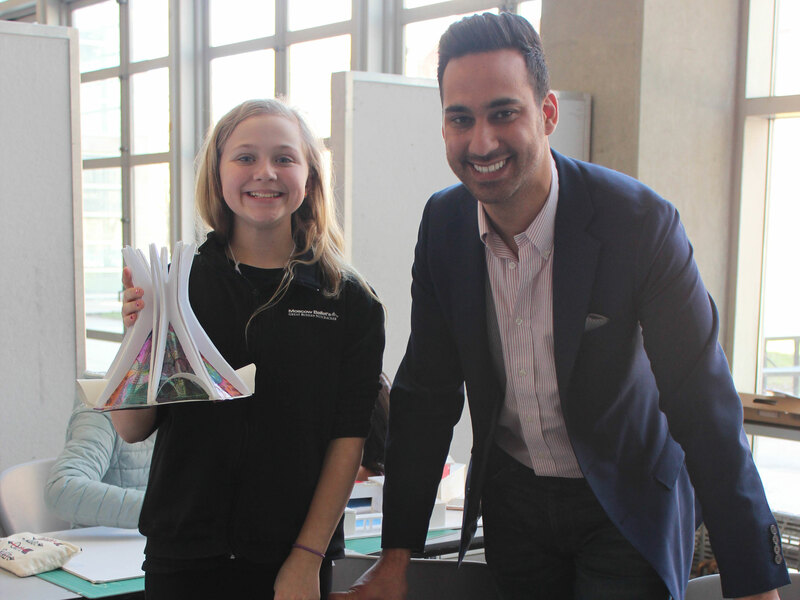 Taha Shawar (Architectural Designer) challenged the students to re-design a building of their choice to better fit a new location. In a way that they become more aware of the outside world, the differences but more importantly the similarities we have as people and as environments and what we do to adapt. This was accomplished by having the students bring a building from anywhere in the world and choosing the most ideal location for it here in the United States, and work on re-designing this building in a way that it could remain functional and adapts to its new environment its placed in. The goal of this year’s challenge was to educate the students on the power of relationship building, through critical thinking and planning, similar to those concerns our architects face on a daily basis. Our hope is for students to gain a better understanding on future design adapted to new environments, while also learning professional skills and building a strong network for future success. 2018 Registration for schools is still open until February 9, 2018. If your school signed up to attend, students can register for their specific challenges until March 9, 2018. More information and applications are available on the Wisconsin Art Education Association website. Information specific to the architecture design challenge can be found in the official registration form on page 7. Site – select a site in the US where the design can address the environmental issues specific to the location (ie, southern US in states like Florida and Texas that need to address flooding, northwestern states like Oregon and Washington that have heavy rain falls; Midwest and northeast in areas with heavy snowfall. Think about whether the environmental issue is an opportunity (ie, lots of sunshine in southwest) or something that needs to be mitigated (ie, too much sunshine in the southwest). How will the shape and form of the micro-house address these polar issues? Find a second location globally that has similar environmental conditions and imagine how the project might change culturally from the US to abroad. The 2018 Visioneer Design Challenge will take place on April 20, 2018 at UWM Peck School of the Arts. The theme this year is “Envisioning A More Inclusive and Global Future”.